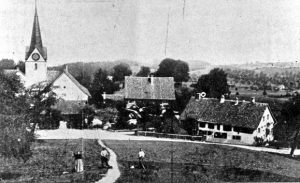 Hirzel, Canton Zurich, Switzerland – the home village Winter’s Landis family from 1488 until they were forced to flee Switzerland in the 1640’s. In 1614, in Zurich, Switzerland, Winter Dellenbach’s ancestor, Hans Landis, an Anabaptist minister, was martyred for his beliefs which threatened both the establishment church and state – there was no separation between the two then. He is a recognized Christian martyr. Anabaptists believed in pacifism and refused to cooperate with the military, swear allegiance to state authority or baptize children. Winter’s Landis and Dellenbach family lines were Anabaptists since the 1500’s and like others of that faith – they were hunted with bounties on their heads, often imprisoned in tiny dungeons where they could not stand, many starved to death, their property and children subject to expropriation. Like many other Anabaptists, the Landis family, fled or were forced from Switzerland to France, then to Germany but the persecution followed them. The Quaker, William Penn, had inherited the land to be called Pennsylvania, granted to his father by King Charles II of England. Penn traveled to the Netherlands, inviting Anabaptists to come to Penn’s Woods where they could live in peace and religious freedom. With financial help from Mennonites in the Netherlands, most Anabaptists quickly left Europe, including Winter’s family. It was leave or die. Anabaptists Johannas Landis and Wilhamina (Margarethe) Naas sailed by ship to Philadelphia in 1717, and settled in Lancaster County, Pennsylvania, to farm the land. They raised 12 children. In America, Anabaptists were known mostly as Mennonites or Amish or German Baptist Brethren. Winter Dellenbach’s family arrived as Mennonites but by 1723 joined the German Baptist Brethren (now Church of the Brethren). The Mennonits and Amish were and are recognized as extraordinary farmers even without the use of modern electric and motorized tools. Some Brethren groups still live “plain” as do the Amish – without electricity, cars, etc., but most are modernized though adhere to the fundamental precepts of non-violence, peace work, and to “live simply so others may simply live”. Even today there are many that can be seen plowing with teams of horses. Over the years, Winter’s family made their way westward from Pennsylvania. Her great grandparents, grandfather and 2 of his brothers left their farm in southern Illinois to claim land in the Oklahoma Land Rush of 1889. President Cleveland opened it to non-native settlement though it was to be “for all eternity”, Indian Territory (tribes from the Trail of Tears were force marched there from the East). Winter’s grandfather, Franklin Benjamin Landis, yet another Brethren minister, married Lily McCammon whose family also claimed land in the Oklahoma Rush. They improved their claim by planting hundreds of fruit trees and berry bushes. They lived in a sod house. Later they sold eggs and cream while raising nine children together. Grandma Lily died of tuberculosis in 1915 when Winter’s mom was 7 years old. Her grandfather then scrambled for money to keep his children together, even collecting and selling buffalo bones off the prairie, left by the millions when the animals were shot for the bounty paid to exterminate herds to deprive Native Americans of food and hides. In 1923, Franklin followed a brother to La Verne, California, a pretty town and safe refuge where many Brethren settled, started a church and soon a college. Franklin’s house is still where Winter’s parents met, and later married in 1930. Winter grew up nearby and remains a Brethren in spirit, embracing its values of peace, equality, service, and justice. This interview was conducted by Maria Vazquez of Winter Karen Dellenbach, the five-times great granddaughter of Johannas Landis and the granddaughter of Lily and Franklin Landis. Winter is a retired public interest lawyer and community activist living in Palo Alto, CA.